I did it. I did it. I finally mustered enough courage to try my hand at baking. Though I wanted to bake a cake the first time, I opted to bake biscuits instead, as they are fool proof and nothing could go wrong with them. I wanted to see my kids reaction and I guess didn’t want to scare them with my baking. Arjun loves biscuits and it is a must for his evening tea. 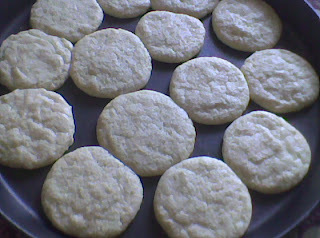 So I opted to make these famous tea time Indian cookies. How I used to love them, smack my lips and enjoy them while eating them as a kid. 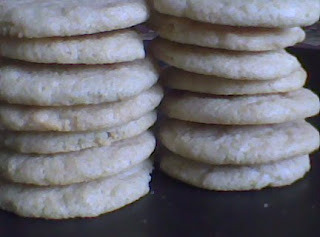 I really really hoped that he will also love these light and melting in the mouth irresistible cookies. Pre heat the oven at 160 degrees. Beat butter, sugar and curd together. Sieve flour, semolina, cardamom powder and soda-bi-carbonate in a bowl. Add this to the curd mixture. Add milk and a make a soft dough. Prepare a baking tray by smearing butter all over. Make small balls out of the dough and press the ball slightly to flatten them to give a cookie shape. Place the flattened balls on the tray leaving enough space between them as they swell in size while baking. Bake at 160 degrees for 15 – 20 minutes on the lower rack. Let it cool on a wire rack. Store in an air tight container. Serve with tea or coffee. looks perfect for coffee time. thank you for the lovely entry. hope to receive more. you have a nice blog. Radhika… I was just browsing thru your recipe index and saw nankatai recipe.. as i posted one recently, i just wnated to check ur version. i was in a surprise as to how you posted this. the ‘i did it’.. it sounded like my post for mango cake. gives me confidence that one day I will be a baker like you 🙂 you have come a long way.. congrats on that.